From left, Ali Yunker, 6-year-old Lukah Gavin and 11-year-old Lydia Gavin play a game of checkers at Saturday's Que for Kids Fundraiser at Sandy's Lone Star Event Center in Nolanville. 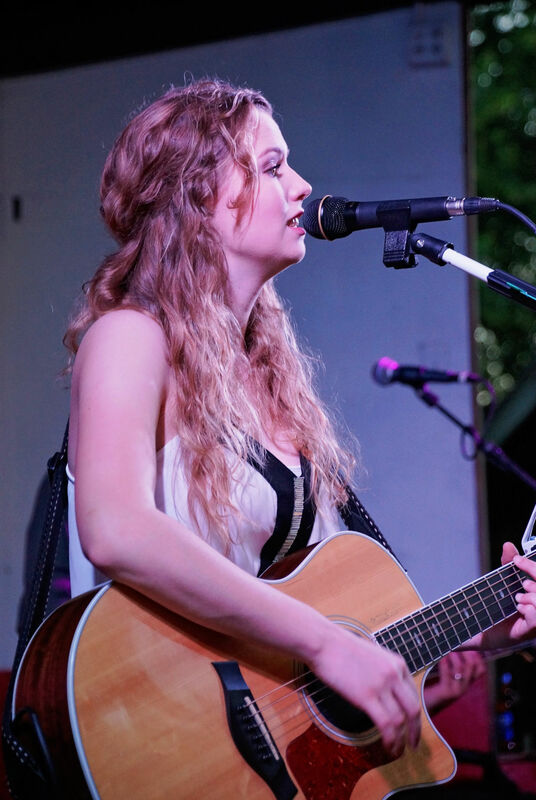 Jenna McDaniel performs at Que 4 Kids at the weekend kickoff Thursday at Sandy's Lone Star Event Center. Crystal Kristinek of Fired Kickin' Ash BBQ checkin her grill in the rain at the Que for Kids in Nolanville on Saturday, April 21, 2018. Although Easter is a little more than a week away, many organizations are celebrating early with egg hunts, spring fairs and photo opportunities with the Easter Bunny himself. Check out this listing for these family-friendly events and more going on this weekend. Que 4 Kids, a fundraising event for Aware Central Texas, continues April 12 and 13 at Sandy’s Lone Star Events at 14600 Farm-to-Market Road 439 in Nolanville. Live music begins at 6 p.m. April 12 with the Texas Twister Band featuring Killeen’s own Mitch Connell as well as Kyrstin Baird. Starting about 10 a.m. April 13 will be kids and family activities, followed by a CTBA-sanctioned barbecue cookoff with a cash prize of $6,500. Kids activities include a video game trailer, a bounce house, and a Twisted Metal Mayhem kids demolition derby and drag race. There will also be a DJ to provide music. A kid’s barbecue cookoff is scheduled to start around 3:30 p.m. Advanced tickets are $15, and $20 dollars at the door. The Kids barbecue cookoff is $40, and participants need to arrive by about 2 p.m. April 13. Parents interested in the demolition derby and drag race must provide their own electric vehicle. For more information, contact Que4Kids.org at 254-449-2022, or visit www.facebook.com/que4kids/. Operation Stand Down Central Texas is hosting a pancake breakfast from 8 to 10 a.m. April 13 at Applebee’s, 2525 E. Highway 190, Copperas Cove. Tickets are $10 at the door and proceeds aid homeless veterans. The Salado Spring Sweep and Texas Trash Off will be from 8:30 a.m. to noon April 13. Volunteers will meet at the Civic Center, 600 N. Main St., to get trash bags and pickers and will disperse to assigned areas from there. Refreshments and breakfast bites will be provided. The Copperas Cove Easter Egg Round Up will be from 9 to 11 a.m. April 13 at Cove City Park, 1206 W. Avenue B. Pictures with the Easter Bunny will be available at this free event. The first annual Oral Cancer Foundation 5K Run/Walk Awareness Event will be at 10:30 a.m. April 13 at Schoepf’s BBQ, 702 E. Central Ave., Belton. Tickets available at www.donate.oralcancer.org. The Kids and Family Spring Expo will be from 10 a.m. to 4 p.m. April 13 at the Killeen Special Events Center, 3301 S. WS Young Drive. Vendors, games, bounce houses, food, crafts, and more will be available. Admission is $3 per child, kids two and under are free. Mae Stevens Elementary, 302 Manning Drive in Copperas Cove, will host an Easter Extravaganza from 11 a.m. to 4 p.m. April 13. An egg hunt, vendors, raffles, door prizes, face painting, and more will be available at this fundraising event. The Boys and Girls Club of Central Texas is hosting a “Writing for Positive Change” anthology book signing and poetry reading from 11 a.m. to 1 p.m. April 13 at the Harker Heights, Copperas Cove, Gatesville, and Lampasas Public Libraries. The Harker Heights United Methodist Church, 208 W. Cardinal Lane, is hosting an Easter Egg Hunt from 12:30 to 1:30 p.m. April 14. The second annual Easter Egg Hunt and Spring Extravaganza will be from 2 to 4 p.m. April 14 at Yettie Polk Park, 101 S. Davis St., Belton. A petting zoo, rock climbing wall, bounce houses and more will be at this free event. The 27th annual Central Texas College Foundation Golf Tournament will begin at 9 a.m. April 26 at the Hills of Copperas Cove Golf Course, 1408 Golf Course Road. Individual entry fee is $75 and the four-person scramble fee is $300 per team. Registration includes a golf cart, green fee, tournament fee, two drinks, and lunch. Deadline to enter is April 12 and can be done by calling 254-526-1662. The Fort Hood Area Lemonade Day is hosting a Design-a-Stand Workshop event from 10 a.m. to noon April 13 at Bronco Youth Center, 6602 Tank Destroyer Blvd., Fort Hood. Military families are invited to view demonstrations on how to build and design a lemonade stand and apply those skills at various stations in preparation for Lemonade Day on May 4 and 5. For more information, go to www.lemonadeday.org/find-your-city. The Killeen ISD Career Center, 1320 Stagecoach Road, is partnering with Lemonade Day to host a One Stop Shop from 9 a.m. to noon April 13. Families and their participating children can design flyers, create business plans, advertisements, and more to prepare for upcoming Lemonade Day. Register online at the www.eventbrite.com. JCPenney stores are hosting a free superhero event at its Kids Zone to celebrate the upcoming release of the new Marvel Avengers movie from 11 a.m. to noon April 13. Kids can come dressed as their favorite superhero and will decorate a Marvel-themed bag of their own to take home. The Harker Heights Library, 400 Indian Trail, is hosting a STEAM Dream Arts and Sciences Festival from 11 a.m. to 2 p.m. April 13. Multiple hands-on activities that encourage children’s learning and skills will be available. A free magic show performance will follow at 2 p.m. The Killeen Copper Mountain Branch Library is hosting its monthly book club meeting form 10 a.m. to noon April 13 to discuss April’s read, “The Botany of Desire,” by Michael Pollen. Every Sunday morning, a free group run is held at various locations. This week, runners of all ages and paces will meet from 7 to 10 a.m. at Purser Family Park, 100 Mountain Lion Road, in Harker Heights. Water and coffee provided. Barrow Brewing Company, 108 Royal St. in Salado, is hosting free live music by Vet Church’s Matt Williams from 7 to 9 p.m. April 12 and X-Factory from 7 to 9 p.m. April 13. Ragland will perform as part of the Sunday Afternoon Sessions from 3 to 5 p.m. April 14. Bo’s Barn Dance Hall and Club will host live music by Kenny Orts and the No Chance Band from 9 p.m. to 1 a.m. April 12. Cover: $8. 35 South will perform from 9 p.m. to 1 a.m. April 13. Cover: $10. The dance hall is at 4984 W. Farm-to-Market 93, Temple. Catch karaoke from 8:30 to 11:30 p.m. every Thursday, with a DJ until 1:30 a.m. Happy Hour is from 5 to 10 p.m. every Thursday, and 5 to 8 p.m. every Friday and Saturday. Get a free dance lesson from 6:30 to 8 p.m. every first Thursday of the month. For more information, go to www.bosbarndancehall.com, or call 254-939-7131. Chupacabra Craft Beer and Salado Lonestar Winery is hosting live music by Steve Hamende from 7 to 11 p.m. April 12 and Deanna Wendolyn from 8 p.m. to midnight April 13. Chupacabra is at 401 S. Main St., Suite #105, Salado. Granger Smith and Earl Dibbles Jr. will perform from 6 to 11 p.m. April 13 at Johnny’s Outback, 301 Thomas Arnold Road, Salado. Tickets are $20 for general admission and $35 for reserved lawn seating and are available at www.outhousetickets.com. The Killeen ISD Fine Arts Department is hosting auditions for its 2019 summer musical, “Aladdin Jr.,” for students enrolled in grades first through eighth in the KISD system from 9 a.m. to noon April 13 at Charles Patterson Middle School, 8383 W. Trimmier Road. The Temple Railroad and Heritage Museum, 315 W. Ave. B, Temple, is open from 10 a.m. to 4 p.m. Tuesday through Saturday and hosts a free, themed family day on the first Saturday of the month. The Night at the Museum Train Ride will be from 3:30 to 6:30 p.m. April 12. Crafts and activities, information about trains and the railroad system, as well as a ride on an Amtrak train to Taylor and a return trip by bus are included for ticketholders. Go to www.templerrhm.org or call 254-298-5172 for more information. In the Mood Ballroom hosts events and dance lessons of various styles throughout the week and is located at 13 and 15 S. Main St., Temple. For more information on future events or classes, call 254-773-7088, email Karen.Keith@inthemoodballroom.com, or go to inthemoodballroom.com. Longhorn Saloon, 2503 S. General Bruce Drive, Temple, hosts music every Friday and Saturday. DJ Able will play from 9 p.m. to 2 a.m. April 12. No cover. DJ Suavesito will play from 9 p.m. to 2 a.m. April 13. No cover.Call 254-771-1364 for more information. Mangos Nightclub, 702 W. Elms Road in Killeen, is hosting Tejano Friday with DJ Chris from 9 p.m. to 2 a.m. April 12. Cover: $5. Riko Mambo will also perform live music with DJ Santiago from 9 p.m. to 3 a.m. April 13. Admission is $10. For more information, call 254-541-8329.